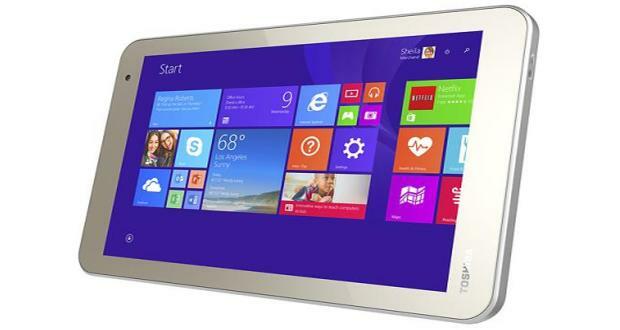 Toshiba just released a new 8 inch Windows 8 tablet, the Toshiba Encore 2. Starting at only $200, the Encore 2 combines a budget conscious device with full Windows 8.1 compatibility. For a little more money ($270), you can get the 10 inch Toshiba Encore 2 which adds a MicroHDMI port and compatibility with an optional keyboard cover. While these low starting prices are compelling, there are several other Windows 8 Tablets in this price range, due to discounts from their original retail prices. Should the Toshiba Encore 2 be your top choice among cheap Windows 8 Tablets? How does the Encore 2’s features stack up versus competing tablets? In my Toshiba Encore 2 review, I discuss the tablet’s features, pros and cons, how it compares to similar devices, and my buyer’s recommendation. Dimensions and Weight: 5.2″ x 8.3″ x 0.37″, 13.4 oz. I found the build quality of the Toshiba Encore 2 to be acceptable when I consider it’s price. Its plastic shell felt sturdy and didn’t flex at all. The screen isn’t as good looking or as touch sensitive as my Acer Iconia W4 but it’s OK. For a budget friendly Windows Tablet, I don’t have any real complaints about the hardware. There was one design decision I didn’t like, however. I would have preferred to have the Windows Start button on the front of the device instead of on its side. While some folks will get use to the button on the side, I prefer to use another tablet instead. My experience in using the Encore 2 was close to that of using other 8 inch Windows 8 Tablets. Launching apps wasn’t fast but it was acceptable. Once apps were loaded, switching between apps was quick. Surfing the web and watching videos worked just as one would expect. I did however experience a few instanced of slowness in launching and using apps. After I completed a couple Windows Updates, I wasn’t able to reproduce these events. I do worry that the 1GB of RAM will cause some slowdown as I open more and more apps at once. I didn’t test desktop caliber apps on the Encore 2. I suspect the 1GB of RAM included with this tablet will be prohibitive when it comes to running desktop applications. If you stick to tablet apps, the Toshiba Encore 2 should work fine. The Encore 2’s biggest advantage over other tablets is its low retail price. Once that price get discounted, I can see this tablet selling like hot cakes. One drawback to note is the fact that the Encore 2 does not come with a free, full copy of Microsoft Office. Even if you don’t plan to write entire essays with an 8 inch tablet, the ability to view and quickly edit Office documents may come in handy at times. If the Encore 2 was the only Windows 8 Tablet available for $200, I would recommend it. Unfortunately for the Encore 2, there are several options in this price range that are more compelling. The Acer Iconia W4 has a better screen and includes an HDMI port. The Asus VivoTab Note 8 has a better screen and includes a stylus that provides active pen support. Both of these tablets come with a free copy of Microsoft Office while the Toshiba Encore 2 comes with only a one year subscription to Office 365. The fact that the Encore 2 doesn’t include Office is probably the biggest reason not to buy the device. On the other hand, I have seen the Encore 2 on sale for as low as $150 at Micro Center. Perhaps that $50 savings will make the difference for some, especially if they don’t need Microsoft Office. How do I Rank the Toshiba Encore 2? While I do like the intended value proposition of the Toshiba Encore 2, I can’t recommend it. There are more compelling Windows Tablets available for the same price. Perhaps I might change my mind when the Encore 2 sees some discounts. Until then, consider an Acer Iconia W4 or Asus VivoTab Note 8 instead. Are you considering the Toshiba Encore 2? What other devices are you considering? What features do you value most in Windows 8 Tablets? Please share your thoughts in the comments section below.